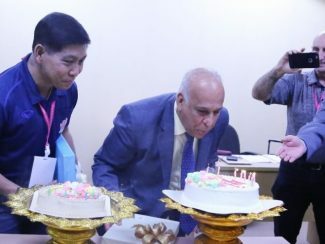 Nakhon Ratchasima, Thailand, September 24, 2018 – Mr Essa Hamza Ahmad Al Failakawi, AVC Executive Vice President and Chairman of the AVC Finance Committee, accompanied by Committee Secretary Mr Riad Tayeh, arrived in Chartchai Hall here on Sunday to watch the final-day matches of the 6th AVC Cup for Women and present awards to medallists. In this occasion, Mr Essa Hamza, on behalf of the AVC, expressed his sincere gratitude to all Control Committee members and referees who had been designated to officiate at the top-tier competition as well as the local organising committee who helped make the one-week, 10-team tournament a significant success. Amidst a pleasant atmosphere but tinged with a bit sadness, Mr Essa Hamza, himself also the FIVB Executive Vice President, said that he felt very happy to be among the volleyball family, those who have a passion for volleyball and those who have involved with this extremely fun sport. But one thing he missed while being there among volleyball colleagues was his beloved family and he just badly needed them to be with him out there…..
As he ended his speech, the light in the meeting room was turned off and two big birthday cakes with candle lighted were carried in. Everyone sang the Happy Birthday song altogether. It was a big surprise! 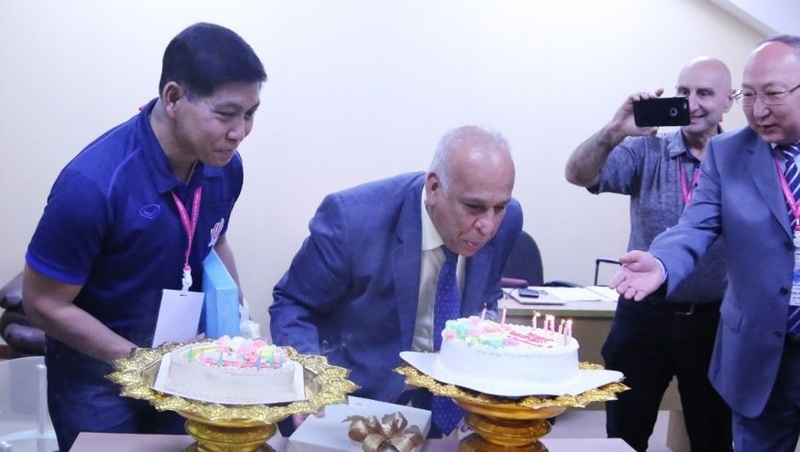 Mr Somporn Chaibangyang, President of Thailand Volleyball Association, Nakhon Ratchasima Governor Mr Wichien Chantharanothai and AVC Secretary-General Mr Shanrit Wongprasert joined hands in hosting the birthday celebration for Mr Essa Hamza and AVC Press Officer Mr Preechachan Wiriyanupappong on the same day. Both blew out candles on birthday cakes, everyone applauded and all smiled and said Happy Birthday to both of them. Mr Wichien also presented apiece a birthday gift. For the duo, it was one of the greatest moments and the scent of a pleasant memory in nostrils remains strong as in days gone by.